Gmail is getting updated with a new feature that converts addresses, phone numbers, email addresses and contacts to clickable hyperlinks. The update is currently rolling out for Gmail on Android, iOS, and the web. Google says the update could take up to three days to roll out completely for all the users. The feature will definitely save users a lot of time. With this new feature, when users will click an address, it will directly take them to Google Maps, while clicking an email address will compose a new email. Finally, on a mobile device, clicking a phone number will start a call. From now, on when users will see an address in their mail body, it will automatically be a hyperlink. Clicking on the link will take the users to Google Maps where they can easily find the location. Similarly, an email address in the email will be a link and clicking it will compose a new email, using the user’s default email client. Finally, if you are using Gmail on your mobile device, and when you find a phone number in your email, it will be a link. Clicking the phone number will place a call request using the default phone app. This feature will not work on the desktop version. ‘’Gmail users often exchange information like addresses and phone numbers with each other to set up meetings, introduce colleagues, and plan events. Precious time can be lost by having to copy and paste this information from an email into other apps and websites, so we wanted to provide a better way to perform these tasks that also saves time. 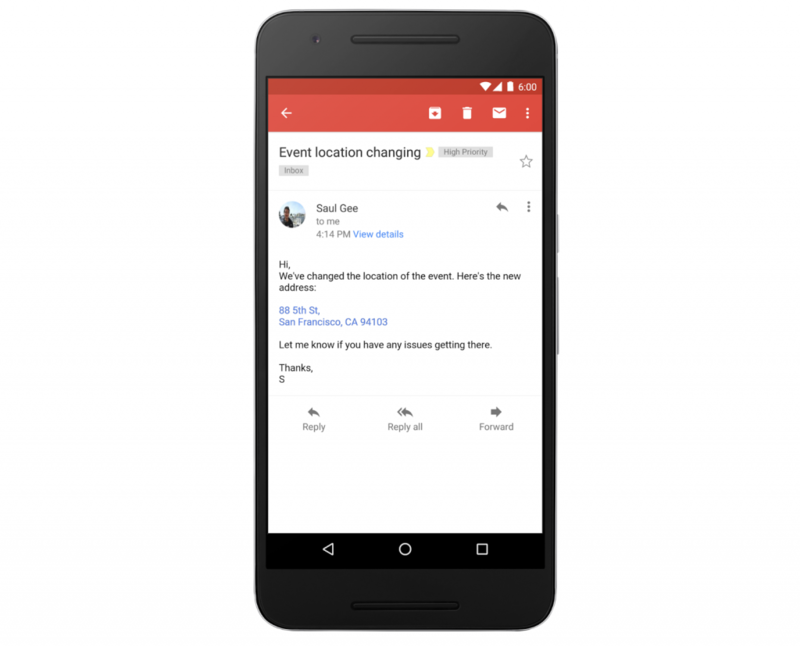 That’s why starting today, Gmail and Inbox by Gmail on Android, iOS, and the web will begin converting text to interactive hyperlinks whenever they detect phone numbers, addresses, and email addresses in emails,’’ Google writes in its blog post.